© 2005, Kevan Hashemi, Open Source Instruments Inc.
S3005_1: Schematic for Transmitter with Logic Chip: SAW Filter and Downshifter. S3005_2: Schematic for Transmitter with Logic Chip: Limiting Amplifier (U7, U8, ), Discriminator (R19+L8+C22 and R24+L9+C26), and Demodulator (U9, U10). Note that the four OPA699 limiting amplifier chips are mis-labeled "OP699". 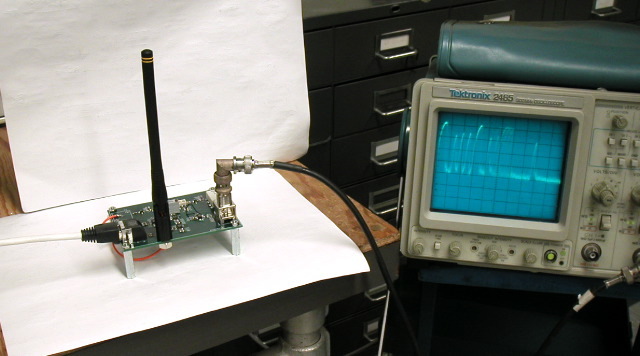 Data Reception: Color photograph of the receiver and oscilloscope screen. The receiver is picking up the thirty-bit data transmission from a Transmitter with Logic Chip (A3004). The output from the receiver is fed into the oscilloscope with a BNC cable, and the scope triggers on the rising edge of the demodulated output. On the oscilloscope, the time scale is 500-ns per division. This manual describes the A3005A, its application to Stage Two of our Subcutaneous Transmitter development. During Stage Three of development, we realised that our chosen modulation scheme, and therefore the A3005 designed for that scheme, was vulnerable to interference, as well as slow and insensitive. We modified the A3005A to create the A3005B, which has its own manual. IF Modulation: An A3004 transmitter is 6 m from a solitary receiver, transmitting 950 MHz for a data 1, and 875 MHz for a data 0. The top trace is the receiver output, and the bottom trace is its IF (Intermediate Frequency) signal at the output of the IF Low-Pass Filter (L7). The A3005A receives 950 MHz through its SAW filter, but rejects 875 MHz. We have tuned the LO (Local Oscillator) frequency to 1000 MHz by adjusting VR1 until the IF is 50 MHz for RF of 950 MHz. There are two possible LO frequencies at which the IF will be 50 MHz: 900 MHz and 1000 MHz. We eliminate the 900 MHz possibility by choosing the setting of VR1 for which the input to the VCO (U4) is higher. We know from the VCO data sheet that the higher input voltage corresponds to a higher output frequency. In the lower trace, we see a cloud of 50 MHz IF when the A3004 is transmitting a data 1. Otherwise we see an amplified combination of thermal noise, 950 MHz interference penetrating into our basement laboratory from outside. We use the IF amplitude, combined with our estimate of the gain in the signal path from our antenna to the IF signal, when we estimate the power received by the antenna. The IF signal is larger at the beginning of a burst of 950-MHz power. This is because the transmition frequency passes through the peak response of the SAW filter on its way to its final settled frequency. We found that the SAW filters varied. Some had peak response in the middle of their pass band, others had peak response to one side of the pass band. The transmitters vary also. Their output frequency at 1-V input might be 10 MHz away from the nomonial 950 MHz. Further Discussion: Our progress report for Stage Two of our Subcutaneous Transmitter development describes in detail how we use it to receive transmissions from an A3004. SAW Filter: Manufacturer's data sheet for the DSF947.5 surface acoustic wave filter that makes this receiver design possible. SAW Response Specified: Manufacturer's graph of surface acoustic wave frequency response. SAW Response Measurement Apparatus: Our function generator provides a 0.4-V to 2.4-V triangle wave for our Modulating Transmitter (report). The triangle wave drives a MAX2624 VCO on the Modulating Transmitter, the same VCO used by the A3005A. The VCO frequency sweeps from 875 MHz to 1050 MHz. We trigger the oscilloscope off the triangle wave, and look at signals on the A3005A to see how the receiver responds to frequencies in this range. The modulating transmitter has an 80-mm wire antenna, but the receiver uses a plastic-encapsulated 900-MHz di-pole antenna. SAW Response: The input to L7, the 95-MHz low-pass filter. The local oscillator (1000 MHz) and sum (1950 MHz) frequencies are hardly detected by the oscilloscope, because its bandwidth is 300 MHz, and the probe we used has a bandwidth of 100 MHz. What we see is the intermediate frequency of tens of Megahertz, and the amplitude of this signal represents the amplitude response of the SAW filter. 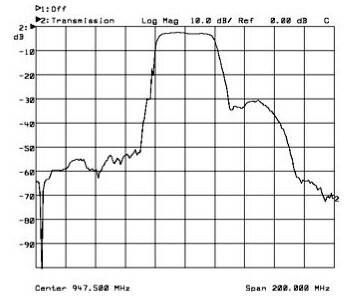 If we assume that the center of the SAW filter pass-band is at 950 MHz, then we see that the Modulating Transmitter transmits 950 MHz when its TUNE input is roughly 1.1 V, which agrees well with the MAX2624 data sheet. SAW and LP Response: The the A3005A output when we disable the two LC tank circuits at the output of the limiting amplifiers, just before the demodulator. The trace shows the combination of SAW response, 95-MHz low-pass filter, ×50 limiting amplifier, and the full-wave demodulator. Before we obtained this response, we adjusted VR1, which controls the LO (local oscillator) frequency, until the IF (intermediate frequency) was 50 MHz for an RF (radio frequency) input of 950 MHz. Receiver Response: The A3005A output versus RF frequency with all parts of the circuit fully operational and the transmitter 1 m from the receiver. In particular, the LC tank circuit before the demodulator selects 50-MHz, and we have tuned the LO oscillator so that in the middle of the SAW passband, the IF is 50 MHz. Hole in Receiver Response: The A3005A output versus RF frequency with transmitter 1 m from receiver and the experimenter's body in a particular position 70 cm aside from the 1-m line joining the transmitter and receiver. There is a hole in the receiver response at around 950 MHz, caused by destruction of the signal arriving at the receiving antenna by another version of the same signal that arrives by reflection off the experimenter's body. It is disturbance of the receiver response like this that requires us to combine the outputs from two receivers. Dual Receiver Response: Two A3005A outputs combined versus RF frequency, with the receivers 1 m apart. Hole in Dual Receiver Response: Here we see three traces. The smaller two are the outputs form each of two A3005A receivers. The larger trace is the combination of the two. One of the individual responses contains a hole, but the other one does not. We find it almost impossible to create a hole in the responses of two receivers simultaneously. Dual-Receiver Data Reception at 5 m: This oscilloscope display shows the outputs of two receivers added together, receiving the thirty-bit data transmission from a Transmitter with Logic Chip (A3004). The outputs from two two receivers connect together at a BNC T-junction plugged into the oscilloscope input. There is a 50-Ω resistance in series with each receiver output, so that the result of connecting the two outputs together is that the combined output is the sum of both divided by two. The received signal is strong and robust for all orientations of the transmitter. The trace is narrow when it is high because the receiver's limiting amplifier has saturated. We see no noise on the high level. But when the output is low, the limiting amplifier is amplifying the antenna input amplifier's thermal noise, and we see a spreading of the trace. Dual-Receiver Data Reception at 15 m: The transmitter is now 15 m from the dual-receiver, and we see the signal strength has dropped until the receiver's limiting amplifier no longer saturates. The high-level output is half the saturated high level, and we see noise on the high-level trace just as we do on the low-levels. If we rotate the transmitter to an unfavorable orientation at this range, the signal diminishes until it becomes confused with the thermal noise. Further Discussion: Our progress report for Stage Two of our Subcutaneous Transmitter development describes in detail how the A3005A receives A3004 transmissions in our laboratory. When we replace the antenna with a 50-Ω resistor to ground, the receiver output is a noise-like positive signal with rms value close to 20 mV. Thermal noise in the SAW filter passband is roughly 1 pW. The antenna amplifier adds another 1 pW. The two combined are equivalent to noise of amplitude 10 μW across th 50-Ω resistor. The gain of the A3005A for RF signals within its SAW filter passband is roughly ×2000 (+66 dB), so the observed 20-mV rms noise output is consistent with the theoretical 10 μV noise input. When we restore the antenna in our basement laboratory, the noise-like output increases to something between 30 and 60 mV rms. When we walk outdoors with the receiver, its output saturates at 400 mV. The same thing happens in Matthew Walker's laboratory, which is on the tenth floor of a building in London. The antenna is receiving unwanted signals from other transmitters operating in the SAW passband. In our basement laboraroty, these signals are attenuated by the earth beyond the walls to around 10 pW. But in Matthew laboratory, they are far more powerful. We were able to get the A3005A to work in Matthew's laboratory by covering the antenna with aluminum foil until the A3005A output dropped to around 60 mV rms, which means the interference power has dropped to 20 pW. The signal we received from a Subcutaneous Transmitter (A3006) at range 1 m had amplitude 200 mV, which means the signal power was around 200 pW. Beyond 1 m, the A3006 signal disappeared beneath the interference. Previous observations suggest that the power we receive from an A3004 (and therefore an A3006 also) at range 1 m will be 800 nW, so the foil must be attenuating the signal from 800 nW down to 200 pW. The attenuated interference power is 20 pW, so we can assume that the un-attenuated interference power is 80 nW. As a rule of thumb, we would like our RF signal to be ten times more powerful than our noise and interference combined. Even in our basement laboratory, interference in the 950±20 MHz band is five times more powerful than thermal noise (10 pW compared to 2 pW). Outdoors in Waltham, and in a tall building in London, interference power rises to 80 nW. The power required to saturate the receiver output at its maximum value of 400 mV is only 800 pW. We have two problems here. First, the interference power is greater than our signal power for transmitter ranges greater than 1 m. Second, even at ranges less than 1 m, the interference power is 100 times more powerful than it need be to saturate the receiver output, so we will never be able to receiver a data zero with the FM transmission system used by the A3004 and A3006. The A3004 transmitter modulates its RF frequency between 875 MHz and 950 MHz. It transmits data at 4.2 MBits/s. The A3004's RF bandwidth is 75 MHz, but its data bandwidth is only 4 MBits/s. In theory, we need an RF bandwidth of only 2 MHz to transmit 4 MBits/s. The A3005A is a 950-MHz RF power detector. It amplifies RF signals between 930 and 970 MHz by ×2000 and demodulates them. But its maximum output voltage, when terminated by 50 Ω, is 400 mV. The output reaches 400-mV for RF input power >800 pW. If an A3004 is the antenna's only signal source, we expect the antenna to receive 800 pW at a range of roughly 30 m in an open field. With greater incident power, the A3005A's IF amplifier limits its own gain so that the A3005A output does not exceed 400 mV. All amplifiers limit their outputs. A rail-to-rail amplifier can drive its output all the way up to its positive supply, and all the way down to its negative supply, but no farther. If its supplies are ±5 V, its gain is ×10, and its input is 1 V, the output cannot attain the +10 V required by the product of its gain and its input. The output is limited to +5 V. When the input switches suddenly to 0 V, the amplifier will take some time to come away from +5 V, because its internal circuits need time to recover from trying and failing to drive the output to +10 V. A limiting amplifier, on the other hand, places artificial limits upon its output, and takes no time to recover from driving its output to these limits. The A3005A use the OPA699 limiting op-amp in its IF amplifier, and the ERA-1SM 8-GHz amplifier from Minicircuits in both its RF and IF amplifier. Although the ERA-1SM data sheet does not advertise it's ability as a limiting amplifier, we find that it works very well in that capacity. With an A3004 transmitter one meter from an A3005A antenna, we observe 800 nW of 950-MHz power at the antenna during a data one transmission. This 800 nW is one thousand times more power than is necessary to saturate the A3005A output. The 800 nW signal is 6 mV across 50 Ω, and when multiplied by the receiver gain of ×2000, would be 12 V if it were not for the limiting amplifiers. When the transmitter switches to a data zero transmission, the antenna receives 875 MHz power instead of 950 MHz power. This 875 MHz power is attenuated by the SAW filter, the IF low-pass filter, and the IF dual LC tank circuits. The receiver gain is ×2000 at 950 MHz, but only ×0.5 at 875 MHz. In theory, the 6-mV 875-MHz input appears as only a 3-mV output. But what we observe at range one meter is a slowing down of the transition from data one to data zero. The 950-MHz content of the data one does not disappear fast enough to give us a transition to data zero within our 238-ns bit transmission interval. At ranges less than one meter, the data zeros begin to disappear. At ranges less than one meter, our Subcutaneous Recorder (A3007) is unable to identify zeros in a Subcutaneous Transmitter (A3006) signal received by the A3005A. The A3006 uses the same FM modulation as the A3004. And so we see that we have a third problem to add to the first two listed in the previous section. Our data zeros begin to disappear for ranges less than 1 m, even when we have no interference. When the interference exceeds the A3005A's internal noise by +10dB, the receiver is no longer able to identify zero-transmissions from the transmitters. When the transmitter is at range less than 1 m, it's zero-transmissions are mistaken for one-transmissions. The A3005B is an modified A3005A, which solves both these problems at once.